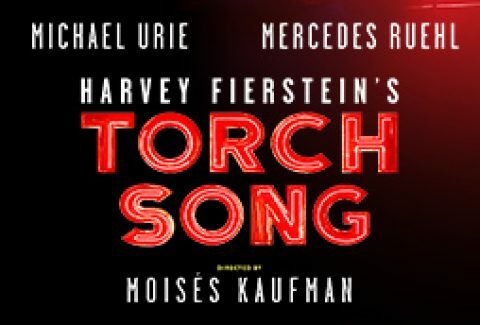 After a smash-hit run Off-Broadway, Harvey Fierstein’s Torch Song heads to Broadway for a strictly limited engagement. Hilarious and heart-wrenching, Harvey Fierstein’s Torch Song follows Arnold Beckoff’s (Mr. Urie) odyssey to find happiness in New York. All he wants is a husband, a child, and a pair of bunny slippers that fit, but a visit from his overbearing mother (Ms. Ruehl) reminds him that he needs one thing more: respect. Join Arnold on this all too human journey about the families we’re born into, the families we choose, and the battles to bring them all home. The New York Times calls it “Irresistible, stirring and vibrant. Burning with emotion behind the laughs, Torch Song still sears.” Don’t miss this critically acclaimed production of the Tony Award®-winning play, starring Michael Urie and Mercedes Ruehl, directed by Moisés Kaufman.